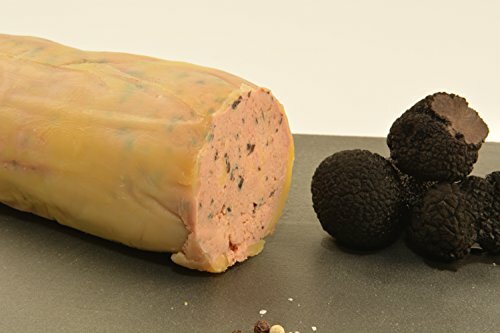 Made with creamy foie gras and 3.5% chopped real Perigord black truffles, integrated into the foie gras torchon style. This French-style product has the perfect mild seasoning of sauternes wine and sea salt. Hudson Valley is the only USDA certified cage-free foie gras farm in the United States. These ducks produce a large and buttery foie gras which pairs wonderfully with earthy pungent black truffles. Slice the torchon straight out of the refrigerator and serve on fancy crackers, fresh French baguette, or toasted baguette or brioche bread. 1.3 pound size is large enough to serve 20 people as an appetizer course or up to 50 at a cocktail party. Unopened, the foie gras torchon lasts at least 30 days. Once opened, consume within 7 days for best flavor, or seal with a vacuum seal device to reduce oxidation and prolong refrigerated shelf life beyond 7 days. This French-style product has the perfect mild seasoning of sauternes wine and sea salt. Hudson Valley is the only USDA certified cage-free foie gras farm in the United States. According to Amazon guidelines, this product cannot be shipped to California. Please contact us directly for help with ordering from California. We ship in insulated boxes with plenty of gel ice to ensure optimum condition upon arrival. If you have any questions about this product by Angel's Salumi, contact us by completing and submitting the form below. If you are looking for a specif part number, please include it with your message.